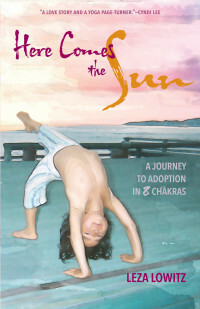 Leza’s book ‘Here Comes The Sun’, from which this post is adapted. Was it my inner voice? The voice of island’s Goddess Pele? It didn’t matter. I didn’t listen. I had no intention of returning to Tokyo, where I’d lived once before. I loved California; there was no going back. Until the day my Japanese husband said he needed to return to Japan take care of his elderly father. And oh, was I coming with him? I didn’t really want to go back to Tokyo, the busy life, the pollution, the stress. But I loved my husband, and wanted to be with him. And I knew that a good marriage was partly based on compromise–even sacrifice. After all, the root of the word sacrifice is sacred. In the highest sense, to make a sacrifice is to do something completely for someone else, with no personal gain. As an independent American woman, that idea took some getting used to. And what would I do in Tokyo? I’d lived there for four years during the Bubble Years, where I wrote for newspapers and magazines, taught English, and worked as a copywriter for a cosmetics company. It was a fun life, a fast life, a life that was great for someone in her twenties. But California had made mush of me, and I loved my slow-pace, my friends and my yoga. Suddenly, I remembered the message about opening up a yoga studio in Tokyo. “Do you think I can do that?” I had asked my husband. Like the fish who can’t see the water, the Japanese were surrounded by the spirit of calm, unity with nature, and an appreciation of the impermanent and imperfect. But somehow, in the rush to modernization and progress, they’d largely abandoned it. And so had I.
I Googled “yoga studios in Tokyo.” Only two came up, so maybe it was a good time to try. “A yoga studio in Japan? Wasn’t that a bit like selling ice to the Eskimos or coals to Newcastle?” friends warned. I was disheartened, but then I broke down this old saw. So-called “Eskimos” have ice all around; their culture is built on it. And Newcastle once depended on coal for survival. What if the ice disappears? What if the coal runs out? Japanese culture is built around nature, but people are stressed out, especially in the cities. Maybe yoga was just the thing they needed–we all needed. I decided not to listen. I decided to stay with Shogo, to go where he went. So we packed our bags and prepared to move back to Japan. Before we left, my sister Rachel gave me a box full of baby clothes her son had outgrown. “For yours,” she said, hugging me. I took a deep breath in, stacked the box up with the others. My son wasn’t here. But it was not for lack of trying. I held onto the dream, though my body did not cooperate. I’d been waiting too long for too many things in life, like starting a family. I’d heard the voice of my child calling me for a decade, but I was still waiting for that child to arrive. I set my intention. I’d open the studio in Tokyo and surrender to the rest. If my yoga had taught me anything, it was that there was freedom in keeping your commitment to yourself, and in trying your best, It didn’t matter what that looked like to anyone else. And in Japan, there was nobility in failure. If you’d tried your best, you could keep your head held high even if you stumbled and fell. Our bags were packed. There was no going back. While we flew over the Pacific Ocean, thirty yoga bolsters and sandbags were sailing to Japan. I knew I’d have to offer Restorative Yoga in Tokyo, it had saved my life almost daily, and I knew what a fast pace that city operated on, that it could help others, too. I didn’t have anywhere to put them, so I knew I’d need to rent a studio. Soon. We found a small, airy room. It was on the market because no one wanted its large built-in credenza. We signed the lease. In Tokyo, there was not much green outside a cup of tea. I wanted to make a calm oasis with a moon window, so we brought some bamboo from my husband’s family garden into the space, bringing the outside in. I too, was an outsider in a closed society. Would there be room for me and California-style yoga here? We’re ready to open, but there’s a hitch. Turns out Customs had to check every prop for drugs, and the props are held up. When they finally arrive, they fit perfectly into the credenza. The deal breaker for everyone else was perfect for us. So I opened my studio. And guess what? No one came. I tried to hold myself together, not to fall apart, to trust that voice that had guided me here. After all, it was in Haiku that I’d heard it. Japan’s the birthplace of haiku, so the gods had to be happy, right? I practiced alone in the quiet, calm space, embracing the nobility of failure, like a samurai. Then one day, I got it: I was waiting for others to come, but I hadn’t yet fully arrived myself. So I rolled out my mat and began my own practice. Day after day, I embodied the space, embraced it. And then, amazingly, my first student came, followed by others. I offered Community classes for charity, though I had been warned they won’t fly in status-conscious Japan. I didn’t listen. I offered Restorative Yoga, Yin Yoga, partner yoga. Everyone said Japanese people will never touch strangers. Again, I didn’t listen. I knew that what had broken down the barriers for me and so many others was universal. If you’re lonely, reach out to someone else. Our yoga teaches us to surrender to everything–even our long-cherished notions of being singular. Soon we had a sangha, and I had a new home. Then, after a decade of trying to start a family, it was time to get serious. To understand that the child was not going to come from my womb. It was going to come from my heart. After all, I’d heard this child calling to me for years. We applied to adopt, even though Japan was notoriously difficult to adopt in, and even though by that time I was forty four and my husband was forty eight, the voice wouldn’t go away. I will have to fight for this child, like I’ve fought for everything in my life. But so what? I am not a victim. I am a yogini. I am a warrior. The yogini’s path is of surrender, strength, grace and acceptance. And if I got to the end of the road and my child didn’t come, I will find other ways to be a mother. I will embrace that quest as another practice. And I will set my intention to be of service, to surrender to whatever will come. As the months passed, I tried to hold onto that intention, tried to see the glass as half-full, but I hadn’t heard the child’s voice for a while. Still, I shook out my yoga mat and went through my practice. Found refuge in that practice, sometimes as the tears wouldn’t stop. I swept my arms overhead, gathering up the light of the sun, bringing prana and hope back in. Bringing in light. I found power in the Warrior Pose, stillness in balancing postures like Half-Moon. I wavered but I held my ground. I opened my heart in backbends, then stretched and twisted to wring myself out. I melted into the earth in child’s pose. I inverted, letting my world turn upside down yet again. The blood rushed to my head, clearing my mind. Or sometimes not. When it came time for Corpse Pose, a posture of deep letting go into the earth, I lay down on the ground, arms out by my side, palms up in surrender, and I rested. Deeply. Every time I met the earth, I asked myself: how deeply could I let go? How much more could I surrender? And I listened for the answer. One day, I felt the contours of my body start to dissolve, then disappear. It was as if I was no longer a body. There was no me. There was no earth. Only a shimmering field of energy. I rode its waves. After some time, I wiggled my fingers and toes and came out of the pose. Then I sat down to meditate. I watched my breath. And then the breath too, disappeared. It was no longer me breathing. I felt myself being breathed. The breath flowed through me. I was a conduit, a vessel for this energy, this life force, this light. And then, instead of waiting for my child’s voice to come to me, I spoke directly to my child. 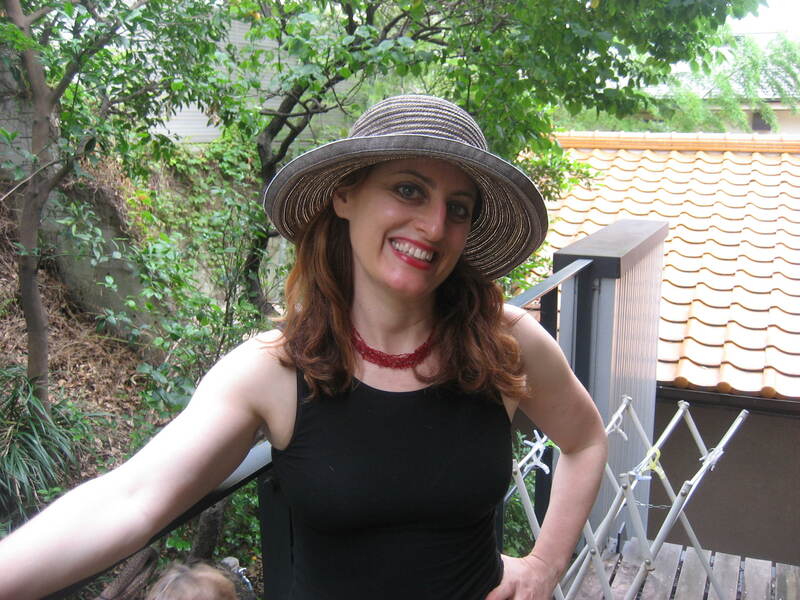 Leza Lowitz is an accidental global citizen–bicultural mother, modern yogini, and multi-genre, award-winning author of over eighteen books. 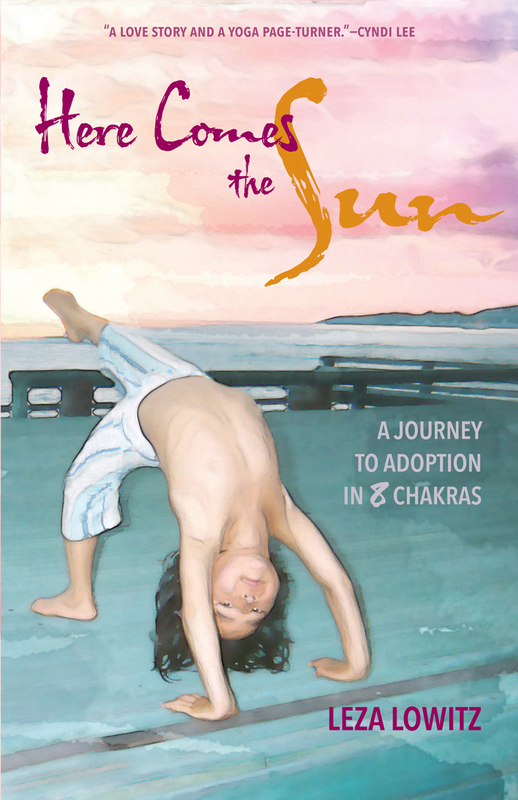 This post is adapted from her memoir about her quest for motherhood across two continents, two decades and two thousand yoga poses: Here Comes the Sun: A Journey to Adoption in 8 Chakras. Her book Yoga Poems: Lines to Unfold By is an amazon best-seller. Her work has appeared in the New York Times, Yoga Journal, Yoga International, Wanderlust.com, Elephant Journal, The Manifest-Station, Shambhala Sun, Best Buddhist Writing, the Huffington Post, and the Japan Times. Lowitz lives in Tokyo where she runs the Sun and Moon yoga studio, tends her century-old garden and cares for her young son, husband, and two half-wild wolf dogs. Find out more about her at her personal website LezaLowitz.com and or at the Sun and Moon Yoga Studio website.